In the league table, Shakhtar have the fifth position (14 games, 23 points), with Zorya following them (15, 22). The Pitmen won two recent away games. Luhansk have not suffered any home defeats this season, winning the four previous meetings with the aggregate goal difference of 12-2. At the same time, a week ago, Zorya lost to Vorskla in Poltava (0-2). The first leg ended in a draw (1-1). 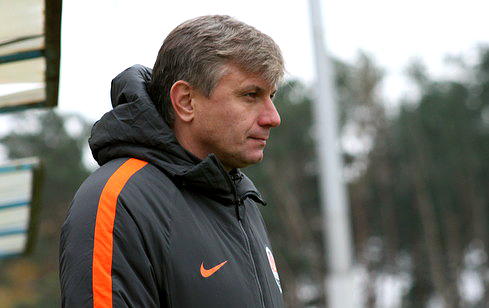 Illia Putrya scored for Shakhtar, and Vladyslav Sandrak-Vinnytskyi scored one for the visitors, topping the league top scorers list with nine goals. Compared to the previous match, there was one change at Shakhtar U19: instead of the injured Oleksiy Kaschuk, they fielded Maksym Andruschenko. On the away field, Shakhtar got off to a confident start and quickly won possession, forcing the entire Luhansk team to defend. Illia Putrya could score early, but his volley went just over the crossbar. On the left wing, the pairing Korniyenko – Andruschenko oprated actively. The later sent a dozen crosses and high balls, with the teammates not picking any. The numerous corner kicks were also fruitless, with long-range shots getting stuck between the defenders’ feet. The most realistic scoring opportunity occurred closer to 30 minutes into the game: Andruschenko intercepted the ball in front of Zorya’s penalty area, playing to the right of Topalov the captain sent it right to Kulakov, but the goalkeeper stopped his header. While the opponents, as it often happens - after resisting the onslaught by Donetsk - converted their only counterattacking chance when Levenets received a pass from deep and, finding himself behind the defenders, beat the goalkeeper. However, three minutes later, the Pitmen equalised. The penalty kick earned some 28 metres away from goal, was executed by Viktor Kornienko, who sent a powerful left-footer right into the top corner to make it 1-1. The visitors might even take the lead. Kulakov won the ball in midfield, dribbled it to the penalty area and fed Putrya. Illia was aiming at the near corner, but the ball took deflection off a defender’s leg. After the break, the opponents made it an end-to-end action, but finishing confusion spoiled the teams’ every combinational effort. Finding themselves in great shooting positions, the players either sent it wide or into the hands of the goalkeepers. Just like that, Andruschenko one-two with Topalov and fired the ball just over the bar from the edge of the box, with Porodko’s attempt from the same distance being stopped by Herasymenko. The game was decided in the closing ten minutes. Initially, the Pitmen went in front: Andruschenko caught the ball in the opposing half and passed it to Topalov, who found Oleksandr Porodko in the penalty area, with the striker beating the goalkeeper. But two minutes away from time, Vladyslav Sandrak-Vinnytskyi rescued the hosts by drawing. 2-2 - Shakhtar and Zorya got their second stalemate over a month’s period. In the next round on November 26, the Pitmen will receive Lutsk-based Volyn. - In the first half, we had every advantage, controlling the ball and attacking ... But in a simple situation we made a mistake in midfield, with our defenders and the goalkeeper being inattentive, with the opponents taking advantage of that fact and scoring. In fact, it turned out to be the only shot by Zorya towards our goal. Even before the break we managed to pull one back, imposing our game again in the second half. We regained the initiative, launching some dangerous attacks, and taking the lead in the second half. However, we failed to save the win. I want to note that Zorya scored the second goal being offside, but that’s no excuse for us. Unfortunately, youth is inherently inconsistent: they lack the experience that would allow them to act in a more simple and secure way while finishing. Of course, the team have deserved to win today and must have claimed the three points. It's a shame when the opponents have two chances and score two goals. It means that we ourselves need to create more chances when attacking to achieve results. At the youthful age, all the teams are equally strong more or less, and they need to seriously approach every game.